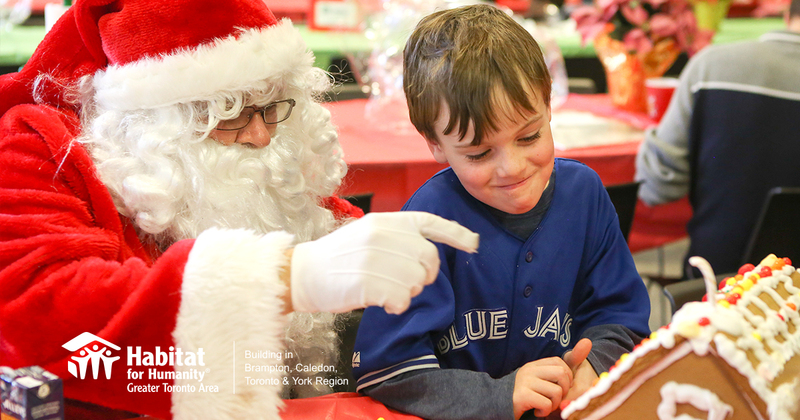 In honour of Giving Tuesday (today), I wanted to remind everyone that the holidays are also a time to give back -- whether it's through financial contributions, volunteering or fundraising. There are many local charities organizing fundraisers, family activities and even offering gifting suggestions that you can purchase for someone less fortunate (in lieu of a gift under your own tree). I try and participate in at least one "give back" initiative each Christmas season, whether personally or with a group. 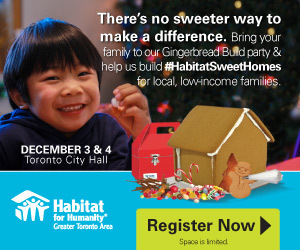 If you're looking for a great family give back, here you go: Habitat for Humanity GTA is holding its 14th annual holiday Gingerbread Build this weekend --Saturday, December 3 and Sunday, December 4-- to raise funds for families in need of safe, decent and affordable housing. Donny and I participated in a Habitat for Humanity build many years ago, and I continue to support the organization through the year. To participate in the Gingerbread Build, pre-order and purchase a gourmet gingerbread kit and book a build shift online at www.gingerbreadbuild.com. All building will happen in the Rotunda at Toronto City Hall. If you can't make it to City Hall this weekend, you can still order and purchase a kit to make at home, at the office or at school. Each kit contains an assembled or unassembled gingerbread house, cookies and a toolbox full of candy. Kits are $50 each and all proceeds from the sale of the kits go to support home building at Habitat for Humanity.